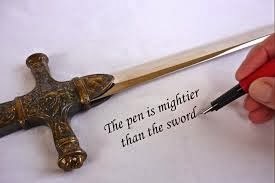 A common saying in our culture is: "The pen is mightier than the sword". Many of you scoff at such a statement, particularly if you're a person who has come to value actions over words. Then we have conceptually contradictory statements such as: "Actions speak louder than words." How can both of these "common sense" sayings be true? Which is more important, words or actions? Like most seeming contradictions, I suppose the answer is that this is a bad question. It creates a false conflict. As an illustration, consider this question. Which is more important, computer hardware or software? The symbiotic relationship that has come to exist reveals that software makes hardware useful; but without hardware, software is nothing more than code on a page (or a hard drive). To belittle either one is to ignore the fact that they are intimately related. So why am I writing this post? I like to briefly address the goal in the beginning of a post so you know my intentions and so I have a solid support beam on which to hang the following paragraphs. My goal is to point out to you that, although actions are vitally important in life, words and dialogue form the very core of who we are as humans. All actions emanate from the words or consciousness of a person. Whether you believe Jesus to be the Son of God or just a great philosopher, you would probably agree that his words are worth consideration. He said "out of the abundance of the heart (consciousness) the mouth speaks". (Luke 6:45) This simple sentence tell us our mind produces thoughts (typically composed of words or concepts) that ultimately dictates what we say; and that in turn, determines how we live our lives. If the seat of our personalities are ignored or damaged, the actions will invariably become maligned. Our society puts a great deal of emphasis on action. We watch sports and see people doing something. We go to work and do things (usually). We devise plans and undertake projects for the sake of accomplishment and progress. But if we fail to properly emphasize the words, the software, the DNA of our lives, we will ultimately fail to be the person, the community, and the society we could have been. Are you having a difficult time maintaining good relationships? Perhaps you need to focus more on your words. Do you struggle to interact with coworkers or acquaintances? Perhaps you should focus more on words. Words are a big deal; they are the steering wheels of life. Big ships and fast cars are impressive, but what they do is determined by the steering wheel. Whether you apply this to parenting, mentoring, teaching, training, or anything else in life, it holds true. A person can become more resilient as they age--they can train themselves to ignore words from certain people. But I believe it is very dangerous to teach that "words will never hurt me". If a person becomes so calloused, so seared, so insensitive to the words of other humans, I believe they are missing out on what it means to be human--to be vulnerable, sensitive, emotional, and passionate. They become robots. Choose your words wisely. Learn new words that better communicate what you mean. Lack of clarity in dialogue is a major cause of human conflict. Be certain you are saying what you want to say, nothing more or less. This might require you removing some words from your vocabulary. Perhaps you'll need to learn some new words. Perhaps you will need to pause and think for a few moments before you open your mouth each time. James 1:19 ...let every man [person] be swift to hear, slow to speak, slow to wrath. What if you are on the receiving end of damaging words? That's a different topic--you might want to check out "Coping with Critical People". Building walls around your heart is not the correct response in my opinion. Confront the offender kindly and tell them their words hurt you. If that doesn't help, remove yourself from their offensive words; and as a last resort, appeal to an authority if the offender is maliciously attacking you with words. Ultimately, you will not overcome their attacks with your own attacks. Evil will only be overcome by kindness and love. Easier said than done! Words give you the ability to show love or hatred, kindness or malice, acceptance or rejection. Your children, your siblings, your parents, and your friends all need you to use words wisely to teach them, encourage them, and show them you love them. Success depends on it. Maybe you like to be lied to; but most of us find it unappealing. The odd thing is that often when we are "lied to", we are actually just receiving poorly acquired or poorly transferred information. Everything in life rests upon honesty and trustworthiness, whether it is Science, politics, or interpersonal relationships. Words are the backbone of honesty. Sure, there are other ways we can mislead people; but words are the biggest player. No matter how careful you are, someone can always find a way to use your words against you. Don't consider this a failure. If you were diligent and honest in choosing your words, and someone misquotes your or takes your words out of context, that's on them. This scenario rears its ugly head most commonly in gossip. For some reason certain people get a kick out of relaying completely unsubstantiated "information", probably because it gives them a false sense of importance. The best way to help these people is to ignore their immaturity and lather them up with kindness and words of affirmation. Eventually they will begin to derive their importance from their good relationships and not their ability to dig up false dirt on everyone around them. Like the world needs more "Enquirers". #3 Words justify or incriminate actions. You've been there, haven't you? There's that sticky situation and somebody says to you, "But you haven't heard the whole story." Being thorough and fair-minded is a full time task, but it's so important! It's amazing to me how quickly I can pass judgment on people before I've heard the "whole story". Then I have to rein myself in and remember that there could be a valid explanation for what I've observed. Although it's tough to not prematurely pass judgment, you are grateful for those people if you're the one being judged without being given a chance to speak. This is why we have due process, trials, and judges. This is the basis for our entire criminal justice system. There could be a justifiable reason why a person did something that would otherwise be considered against the law, or even heinous. Why would you ever burn down a building? That's crazy! Unless it was filled with leaking containers of Ebola virus that were about to be used by bioterrorists! Then you should have used more gasoline. Get the story. If not already, there will likely come a day when you will need to use words to justify or vindicate yourself against accusation. I suggest you put a healthy emphasis on words so that you know what to say, and how and when to say it. Have you ever considered that is the whole job of an attorney? They use words wisely--that's it. But how much do they get paid? Must be important. #4 Words make an impression. Perhaps you've applied for a job. I hope so. Regardless of the field or industry you're in, I am reasonably certain your hiring manager mentioned something about "communication skills". Whether you're a cashier at a gas station (which I have done) or presenting a highly technical presentation (which I have also done), people want to understand what you're saying and trust that you are saying it right. This point synthesizes the first three points into an application--that your personal success is invariably fused to your ability to use words. Keep something in mind. I am not talking to you right now. You are reading my words. There is a written and an oral aspect to words. You might be a good talker and a bad writer, or a mediocre talker and a great writer. Everyone has inherent strengths and weaknesses, but your will power is what will even the playing field. Make it a point to improve on what you know is lacking. Most of us would like to make more money, and one of the ways you might accomplish that is by sprucing up your use of honest words. The greatest barrier to the eternality of words is the evolution of language. We typically don't read one thousand-year old literature because the translations from those old languages are bumpy at best. There are a few exceptions, such as the Bible. I don't know what you believe about God, but I would say He made a very wise decision to put His most important investment in mankind into a book--full of words. Words are ageless. They will never go out of style. They even have words in Star Trek. No matter how our weapons change and our conveniences advance and our methods to harvest energy from the earth evolve, we will always use words. Why does this matter? Because words leave a legacy. If you write for the public, or for your family, or for anyone, it will be here long after your body fails. It might even form the minds of future generations and ultimately shape the world in a better way. Never underestimate the power of your words! So which is it Dan? The pen or the sword? Contrary to popular folklore, there are stupid questions. This one applies, because the pen gives a person the reason to pick up a sword, or not to. The pen justifies or criminalizes the sword. Words inspire action, and action validates words. Learn words, find new ones, and use them to shape the world. Another great post! (I couldn't help but wonder about the correct usage of the word "payed" vs "paid" in paragraph #3?) Well done, Dan!